You can contribute to the Junior League of Collin County mission while increasing your own brand awareness in the process. Advertising space in Legends & Legacies is reasonably priced and offers the benefit of exposure to an educated, high net-worth demographic. 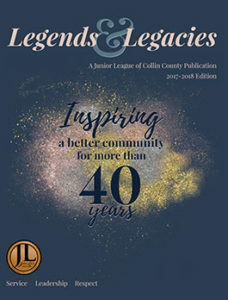 Legends & Legacies is the Annual Report Magazine of the JLCC and is distributed to over 13,000 consumers at our annual ‘Neath The Wreath Holiday Gift Market. Readers include members, sponsors, and partners of JLCC. Donors/Sponsors receive advertising in this publication as a Benefit of Sponsorship depending upon the specified donation level. 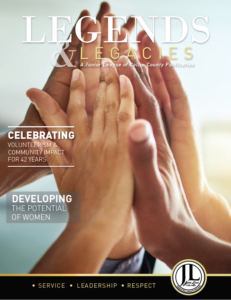 2018 Legends & Legacies Advertising details – please click here.